As the Army continues to grow its presence in the Pacific, the service is studying new technologies and solutions in areas such as communication and transportation to span the vast region, the top Army general for the region said. "We view ourselves kind of as the world's largest battle lab, where concepts for operations and technologies can be tested and shaken out," Gen. Vincent Brooks, commanding general of U.S. Army Pacific, said. Since the U.S. rebalanced its focus to the Pacific, the Army has increased by about 40 percent the number of forces assigned to the region, Brooks said. "Often the question comes up: 'Is the rebalance real?' " he said. "I can say absolutely. It is for the U.S. Army." The increase in troops — as many as 86,000 soldiers — and initiatives such as Pacific Pathways, which sends units on three- or four-month deployments to participate in a series of bilateral and multinational exercises with foreign militaries, has given the Army "a lot more flexibility" to engage with partner nations and "send a message of presence and commitment that frankly could only be done by ground forces," Brooks said. However, one of the key challenges in the area is its size. "The first [challenge] we always have to acknowledge is how to defeat the tyranny of distance in this region … and how to be projected and postured well throughout the region beyond where our bases are located," Brooks said. Most of the Army's Pacific-focused troops are based on Hawaii, Alaska, California, Washington State, Guam, Japan and Korea. "So many of our interests go beyond those geographic areas," Brooks said, including Bangladesh, Myanmar, Thailand, Malaysia, the Strait of Malacca and Indonesia. With the vastness of the region comes the challenge of reliable long-range, high-bandwidth communication. "How do we do that in the kind of distances we are talking about?" Brooks said. "You can imagine a place where it is always winter somewhere and it is always summer somewhere, you literally go from penguins and polar bears and from Hollywood to Bollywood. That is a huge area, and consequently, our communications will be stretched in ways that we do not experience in other parts of the world." There also is the challenge of interoperability, Brooks said. Unlike in Europe, where the U.S. is part of the NATO alliance, "we do not have the same kind of standardization that you will see in Europe, for example, that while sometimes cumbersome is actually a very efficient way of making sure that there is interoperability from the design stage," he said. The Army in the Pacific does not know who its partners might be in any given crisis, such as disaster response, until the incident occurs, Brooks said. "So what are the technologies, what are the policies that make it possible for the U.S. to be a member of a multinational response, and often the communications command and control nucleus of that response, with the ability to add on players who have a wide array of capabilities?" he said. Some of the region's partners have old radios in the FM spectrum, while others are operating purely by cellphone, he said. "How do you bring all that together?" Brooks said. Australian army soldier Lance Cpl. Vinnie Rami, left, guides U.S. Army soldier Sgt. 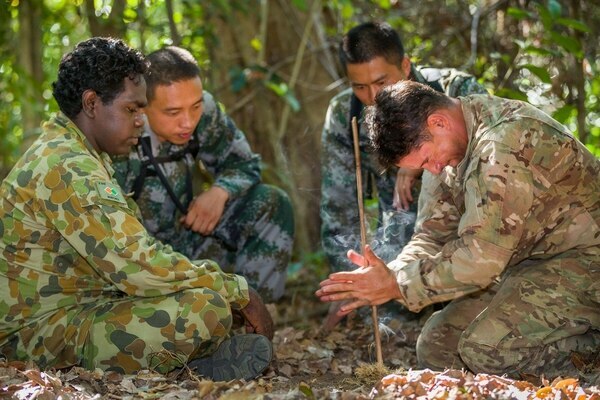 1st Class Adam Marques, right, through creating fire using the traditional drill method during Exercise Kowari 2015 in the Daly River region, Northern Territory, Australia, on Sept. 1. U.S. Army Pacific also is looking at technologies for movement and lift. "The reality is we are moving in 2015 the same way we moved in 1898, and that is you put troops on a ship, you put their equipment on a ship, and you move them," Brooks said. "That is how you move in the Pacific. But what are the technologies for lift for the Army? Are the resources in the right place to extend our lifecycles for the Army watercraft that are critical to us and the joint team in the region?" For example, most soldiers deploying for a Pacific Pathways mission travel by air, but their equipment and the soldiers required to maintain that equipment travel by sea. These soldiers are tasked with everything from rinsing down the saltwater that could corrode the unit's trucks to maintaining the equipment so it's ready to go upon arrival. "We are not built to operate from the sea. We are transported on the sea," Brooks said. "As a result, we have got to make sure that we are taking care of our gear while it is en route." The Army also is interested in how it can adapt existing Army systems to operate in areas that are bounded by water, Brooks said. "That is everything from helicopters and unmanned aerial systems to precision surface-to-surface fires," he said. "How do you do that in a way that we can operate, as the Army operating concept describes, across domains as a value-added player in a joint team? We are thinking our way through that." Operationally, the Army continues to build partnerships and relationships with its partners in the Pacific. "The importance of U.S. presence and engagement in this region and others" is critical, Brooks said. The value of Phase Zero operations — preventing and shaping operations such as theater security cooperation and exercises with partners — can sometimes be difficult to measure. "How [do] you measure return on investment of our presence and deployments and our posture in terms of actual deterrence or actual relationship outcomes?" Brooks said. "There are some things that become evident, like access basing, overflight, those types of things, but they tend not to become manifest until such time as they are in immediate demand." So, for example, if the U.S. is called to help Nepal after an earthquake, asking for the ability to fly over Nepal becomes an issue only as the crisis has occurred. "Their decisions are often influenced by the relationship they have with you prior to that time," Brooks said. "So we find it is valuable and necessary to be engaged, yet there is a challenge for [it] to be appreciated and understood that Phase Zero is a necessary part of our operations and saves costs later." Spc. Bobbi Sue Sanders and her Chinese counterpart deliver immediate care to volunteer patients during the 2015 China Disaster Management Exchange practical field exchange Jan. 18. This level of commitment and presence requires money, and U.S. Army Pacific, like the other Army service component commands, is focused on "finding the proper funding streams to resource the operations and activities that we have in this region," Brooks said. For example, the Army has a terminal high altitude air defense unit continuously committed and deployed in Guam, but it's being paid for out of the base budget. "The base budget, of course, is designed on [the unit] being at Fort Bliss, Texas, not being in Guam continuously radiating and having its equipment exposed to the elements 365 days a year," Brooks said. Overseas contingency operations "do not include operations in the Pacific, so finding the right funding stream to properly resource the reality of the operations we have out here" is challenging, according to Brooks. Another challenge is access to the National Guard and Army Reserve forces for "predictable, limited duration missions without mobilization," Brooks said, such as a short-term engineer mission. "There is an authorization, there is not an appropriation, so the dollars are not there," Brooks said. "That is another challenge, getting the resourcing that is necessary to support the actual operations that are ongoing in this region because frankly the rules have not been stretched adequately, and the resources with them, to reflect the nature of the rebalance in its fullness." There remains great opportunity for continued partnership in the region, however, even with countries that have a "tricky" relationship with the U.S., Brooks said. "It is one of the tricky relationships we have to work through given the military coup that happened, led by a former chief of the Royal Army who is now the prime minister," Brooks said. The relationship with China "often is viewed as an adversarial relationship, but in our approach, it does not have to be," Brooks said. China is a major trading and economic partner of the U.S., and the two militaries have an "emerging" relationship, Brooks said. "We are trying to capitalize on that and build some relationship with the People's Liberation Army in this window of opportunity we have, where we do not see a direct collision between the People's Liberation Army forces and the United States Army forces, not in the near horizon," Brooks said. The two armies have conducted a number of exercises that "are increasing in number and increasing in quality and scope," he said. Most of the exercises have focused on disaster management, and they're "just short of a full-blown exercise," he said. Last year, Chinese and American soldiers were in China, "shoulder to shoulder on a rubble pile working through a debris strewn area" practicing disaster management techniques and responses, Brooks said. The previous year, the exchange took place in Hawaii, and the upcoming exchange is scheduled for Joint Base Lewis-McChord, Washington. The U.S., along with Australia, also recently conducted a trilateral survival exercise with the Chinese. The event took place in the Australian Outback for the second year in a row, Brooks said. "Soldiering is soldiering no matter where you are, and when you put people together, they bond," he said. The key to growing these relationships is recognizing what each country needs and learning how to best partner with them, Brooks said. "Our troops are loving these deployments, these engagements, these operations that they are undertaking, and our regional partners value our presence, the professionalism of our soldiers, the clear expression of commitment when we come to their country for these exercises or choose their countries as part of Pacific Pathways," he said. The opportunities for growth are everywhere, Brooks said. "The doors are open from Australia to New Zealand to Oceania to Indonesia to Singapore, Malaysia, Brunei, Vietnam, Cambodia and Laos," he said. "The doors are now open to us, and we are trying to do the best we can with the forces we have to wisely engage with these countries."